The Last Island hurricane of 1856 was an intense Atlantic hurricane that destroyed Last Island in southern Louisiana. The first tropical cyclone, first hurricane, and first major hurricane of the season, it rapidly intensified before making landfall as a Category 4 hurricane. The powerful winds and storm surge of 11–12 feet destroyed the island, which was a popular tourist resort. The cyclone killed more than 200 people. According to modern estimates by NOAA, the storm probably approached Category 5 strength, and its central pressure has been estimated around 934 mbar. It tied with Hurricane Hugo as the tenth most intense hurricane to hit the mainland United States. A hurricane hits the Louisiana coast, killing more than 400 people, on this day in 1856. Isle Derniere, a resort community, was totally submerged by the storm surges. 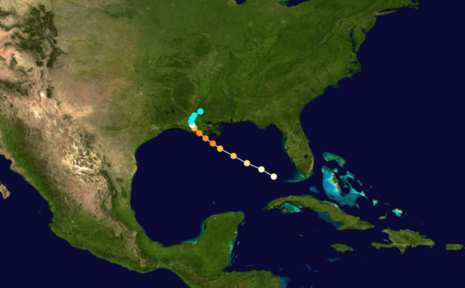 This hurricane, which came before scientists began naming big storms, probably formed in the southeastern Gulf of Mexico and moved northwest toward the Alabama coast. At that point, it veered due west and just missed a direct hit on Mobile, Alabama. Instead, the storm headed right for the mouth of the Mississippi River and devastated the Louisiana coast. Written reports of the storm describe it as the worst that anyone at the time could remember. The worst-hit place was Isle Derniere (Last Island), a resort for Southern aristocrats near the Terrebonne Parish. The storm first brought blinding and torrential rain, which, when combined with strong winds, felt like daggers to the people on the ground. Next, storm surges carried water from Lake Pelto onto the small island from the north. Then, a tidal wave of water from the south devastated the residents. Reportedly, upwards of 150 people were carried off with the wave, with some bodies ending up six miles away. By Saturday morning, August 9th, the winds crossing Carillou Bay had strengthened and the surf on the Gulf of Mexico became violent enough to bring many of the guests to the beach to watch. Some became nervous, realizing there was no way off the island until the streamboat Star arrived that evening. However, evening came and the Star did not arrive. The full force of the storm hit Sunday morning. The Star finally arrived at mid-morning, but was unable to dock and ran aground. Captain Abraham Smith dropped anchor and gave orders for the wooden cabins to be removed, leaving only the hull of the ship intact. This enabled it to remain anchored instead of being dragged across the island by the wind. By afternoon, the water rose from Carillou Bay on one side of the island and the Gulf of Mexico on the other. At the height of the storm, the island was completely inundated. After four hours every structure had been destroyed and 174 people had died.